The world may be transfixed by the horrors of Syria or perplexed by the politics of the Gulf, but important developments are also under way in Iraqi Kurdistan. Mired in crisis, the self-governing region is headed for a controversial referendum on independence on September 25, followed by high-stakes parliamentary and presidential elections a month later. But as it happens, this popular referendum is also a very unpopular one. Arab Iraqis are outraged that their Kurdish compatriots hope to abscond with the northern tip of their country and a large part of its oil wealth, and they have the neighborhood at their back. Turkey, Syria, Iran, and the United States are all on record as opposing the referendum. In Kurdish hands since the 1991 Gulf War, northern Iraq has long functioned as a key prop for U.S. operations in Iraq and, since 2014, as a main base for the American-led war on the so-called Islamic State. Turkey and Iran also have vital interests in the area and both wield influence over local politics. While none of these governments oppose broad Kurdish autonomy, all are vehement about the need to preserve Iraq’s formal unity, fearing that secession would throw Iraqi politics into permanent disarray and unleash an epidemic of new conflicts across the region. If held according to plan, the referendum still seems likely to result in a resounding yes to independence, but it won’t produce an internationally recognized state in the foreseeable future—and Kurdistan’s leaders know it. A substantial number of Iraqi Kurds are in fact also skeptical about the independence vote, or at least cynical about its timing; and many in the minority communities that make up a quarter of northern Iraq’s population find the idea of secession frightening. For all of its historical and national significance, the independence referendum is widely understood to have been born out of an unseemly intra-Kurdish power struggle, revolving around Kurdistan Regional Government President Masoud Barzani’s attempt to use unconstitutional methods of clinging to power. The crisis goes back to summer 2015, when Barzani, a wily 71-year old guerrilla-leader-turned-politician who also heads the Kurdistan Democratic Party, or KDP, refused to step down at the end of his mandate. As protests rose, KDP security forces barred the speaker of the Kurdish parliament from entering Kurdistan’s capital, Erbil. The legislative branch has been out of session ever since, though there are now efforts underway to revive it. Once Barzani had managed to schedule a vote for September 25, he called parliamentary and presidential elections for November 1. The KDP leader had previously promised not to stand for reelection again, but critics suspect he will use the referendum to gain time and swathe himself in Kurdish pride while figuring out how to cling to the presidency. The quest for Kurdish self-determination is not merely some elite level ploy, however. Nationalism really is the name of the game in Kurdish politics. The quest for Kurdish self-determination is not merely some elite level ploy, however. Nationalism really is the name of the game in Kurdish politics. Every political party of consequence holds to the goal of an independent nation, including Barzani’s traditional rivals in the Patriotic Union of Kurdistan, PUK, a leftist-nationalist group that holds sway in the eastern half of the autonomous region around Suleimaniyah. Many non-KDP politicians were accordingly quick to clamber onboard Barzani’s referendum bandwagon, whether out of nationalist conviction or to avoid being branded as unpatriotic. Intra-Kurdish disputes aside, the referendum may also cause turmoil in areas seized by the Peshmerga—the KDP and PUK’s militia forces—in the aftermath of the Islamic State’s 2014 attack on Mosul. 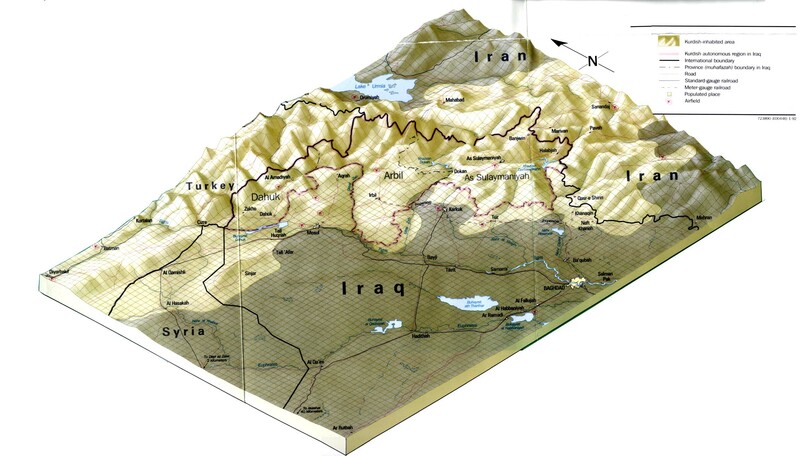 Kurdish claims to these regions are hotly disputed by Baghdad and, indeed, by many of the inhabitants, some of whom belong to other ethnic or religious groups and maintain their own alliances with Baghdad or with Iraq’s neighbors. Kurdish Lands map. Source: CIA. In late August, when the provincial council of Peshmerga-controlled Kirkuk voted to take part in the referendum, Arab and Turkmen delegates boycotted the vote and there were howls of protest from Iran and Turkey. According to Drott, the authoritarian methods of the Kurdistan Regional Government, its haphazard organization of the referendum, and the fact that so much of the non-Kurdish population remains displaced after the war against the Islamic State has made a fair vote virtually impossible in the borderlands. Might the Referendum Be Postponed? The United States opposes the referendum. Skeptical of Kurdish plans for independence in general, U.S. diplomats have been particularly critical about what they see as a poorly timed and organized vote. To have a referendum “on such a fast timeline, particularly in disputed areas, would be, we think, significantly destabilizing,” said Brett McGurk, the U.S. special envoy to the anti-Islamic State coalition. American diplomats have urged Barzani to at least postpone the vote. It wouldn’t be the first time that this has happened. In 2014, Barzani scheduled an identical independence referendum after the Islamic State’s capture of Mosul, a defeat which had just shredded Baghdad’s influence in the north of Iraq. However, he was forced to eat his words almost immediately, when the jihadis turned their guns on Erbil and the KDP Peshmerga had to be bailed out by the U.S. Air Force. In return for American air support, Barzani had to call off the referendum—or postpone it, as the face-saving phrase went. But this time around, Kurdish politicians seem determined to make the vote happen, sensing that the political window created by the Islamic State crisis is about to close. In a recent interview with the Saudi-owned daily al-Sharq al-Awsat, Barzani said he would not postpone the vote unless he receives iron-clad guarantees that the results of a delayed referendum will be accepted by Baghdad and its allies. With only three weeks to go, there now seems to be too little time to organize a credible referendum, but also too little time for Barzani to gracefully back down. Still, the world won’t end on September 25. Whether the Kurds vote yes or no or not at all, local politics will soon snap back to normal. That may seem alarming to Barzani, whose position remains uncomfortably unconstitutional, but he’s got it all figured out: as soon as the referendum results are in, all parties will need to scramble to get ready for the presidential and parliamentary elections thirty-five days later. As new problems pile up, so do the opportunities. Whether Barzani intends to stay in power, anoint a successor, postpone the polls, or engineer some sort of leadership makeover, a successful referendum will put fresh wind in his sails at a moment when the opposition is in disarray—though a low turnout could do the opposite, too. For all the Iraqi and international protests, a ‘yes’ vote is also unlikely to cause much mayhem in the region. Nothing in the referendum obligates Kurdistan to secede from Iraq—in effect, it is an opinion poll, not a legal blueprint for dividing the Iraqi state. A ‘yes’ vote on September 25 would release a toxic puff of angry statements from Baghdad and it might also deepen the Arab-Kurdish split and stir up ethnic unrest along Kurdistan’s contested borders. All very deplorable but Barzani will probably manage, and may even find a way to exploit the uproar. If cool heads prevail, that might be the end of the story. Having pocketed his gains in the referendum, Barzani could move quickly to limit the Arab and international fallout by making conciliatory statements about the non-binding nature of the vote, and then turn his attention back to Kurdistan’s increasingly messy internal politics. It’s a long game, and he plays it well. But although there is no underestimating the ability of Kurdistan’s ruling elite to simply muddle through any crisis, their style of politics may be getting closer to its expiration date. Unless oil money and investments begin to flow again, both KDP and PUK will likely find it hard to sustain the patronage networks that underpin their power—and although every new crisis in Iraqi Kurdish politics might be manageable on its own, aren’t the crises now arriving a little too frequently for comfort? Cover Photo: Masoud Barzani at the frontline against the Islamic State between Erbil and Mosul in September 2014. Source: Kurdistan Regional Presidency. Kamal Chomani, email interview with the author, September 2017. Omar Sheikhmus, email interview with the author, September 2017. Carl Drott, email interview with the author, September 2017.